TIGF! Welcome to another Friday Bloggers Challenge - this week I gave the challenge players this sketch to use as inspiration. I created two cards using this sketch - but rotated the sketch to work for my images. For both cards, I used the Spectrum Roll Technique using Caribbean Sea Ink as my color. I did however have to use SU's Shimmer card stock for my Silhouette images, as they did not stamp well on the Matte coated card stock. 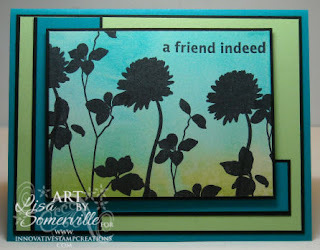 This first card uses Natures Silhouette II from Innovative Stamp Creations. The Spectrum Roll on this card is much brighter, as it's the beginning of the roll, and on Shimmer Card Stock, so the color doesn't soak in as much. All images are stamped in Black Archival Ink. Have you seen this great deal ISC is running on their Stampers Delight Box . This box is filled with awesome products at a great price! Here's my other take on this weeks challenge. The Spectrum Roll was done on Matte Card Stock, and is actually the end of the run, thus the lighter colors. I trashed the beginning run, while stamping the Silhouettes, as the Black Ink pooled instead of soaking in. 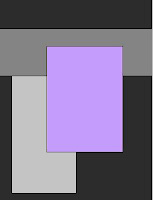 The Matte is great for line art images, but bold images don't stamp as nicely in my opinion. 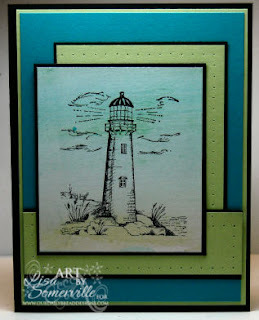 The lighthouse is from Our Daily Bread Designs Light of the World. Be sure to click on the Bloggers Challenge Logo on my side bard to see what the other players created this week! Thanks for stopping by, have a great weekend! Love your work and especially like the one using Natures Silhouette II, just my sort of image, but bet we can't get it here in the UK ! Both are wonderful, Lisa! Great job with the sketch challenge. Wow!! 2 more STUNNING cards!! love the cool colors! I love them both. I love the color combination. Both cards are beautiful Lisa, pretty. These are beautiful, love the color combo! Great as always! OH! Pretty! WOnderful colors and I love what you did with the sketch, I struggled with this one! Both your cards are gorgeous. Beautiful work Lisa. Fabulous Lisa...I love the colors you used. The bold look of the Silhouette flowers is wonderful. I also love the Lighthouse image and it has such a calming feel about it. Here come the questions!!! Archival ink.. is that for scrapbookers? does it need to be heat set? i love your spectrum roll and i think you did a fab job with both projects. :) You rock. Love them both, the colors are so vibrant. Both cards are really pretty! Great color combo! Love the color combo!!!! Gorgeous! These are both so PRETTY! I love the colors that you get when you do the spectrum roll! Gorgeous! Beautiful cards. The spectrum roll is such a great background! Really like the sketch this week! Beautiful, Lisa! The color combination is the perfect backdrop for both images. Very nice! Everyone is using such great colors for this one! Both cards are very pretty! Love the colors you chose! Thanks for sharing 2 cards! The are both great! Two beautiful cards Lisa! Thanks for sharing!!! Happy to see you did 2 cards too! Both of these are just stunning! Great sketch and gorgeous cards! Thanks Lisa!! Both of your cards are beautiful!! I really like the lighthouse one.